Project 6581 kickstarts 10th anniversary celebrations of two micro residency, Youkoubo artspace in Japan and INSTINC in Singapore, reinforcing our key mission of encouraging collaboration, cultural exchange and sharing of ideas in contemporary art with local as well as international artists. The final group exhibition titled Parallel Perception & Counter Connection will feature a range of installations, drawings, paintings and photographs by eight artists. This exhibition is curated by Kelley Cheng, creative director for The Press Room. 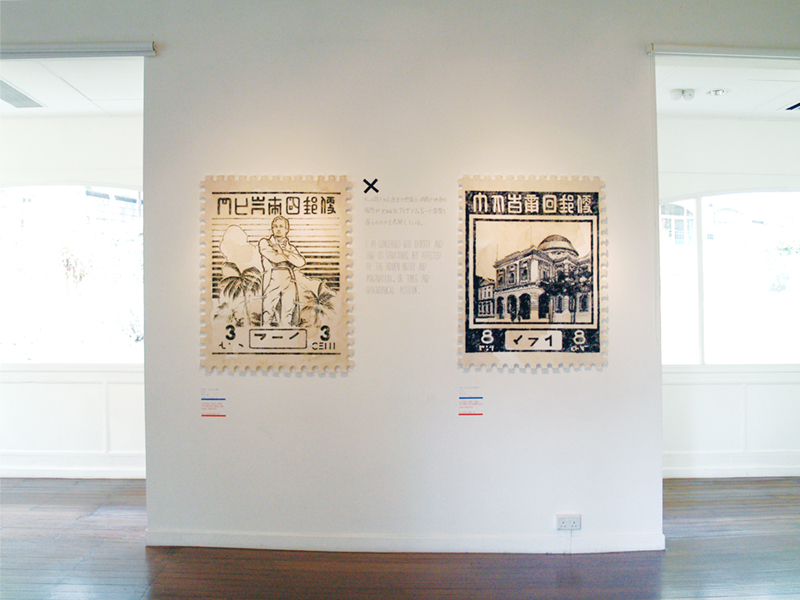 If an oversized stamp existed and we saw the photo of it, how we could imagined this was an oversized stamp? Well, we see a building. But we really see it, we really know it? 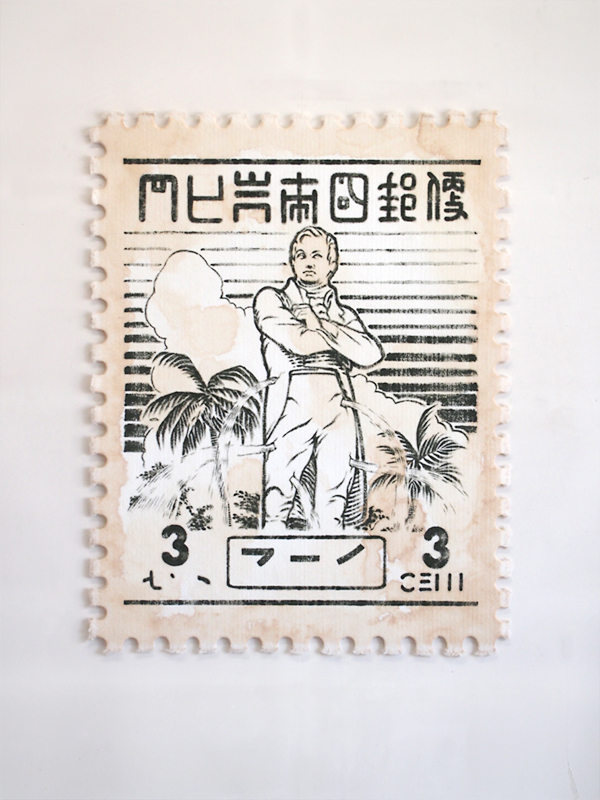 The theme of this oversized stamps is the hidden connection between Japan, Singapore and England in WW2, especially based on the book of English scientist, Dr.E.J.H. Corner. This book told a friendship between these three countries in the period of the war, and the mein scene of the story is the Shonan Museum, currently called National Museum of Singapore. This museum was the place entrusted the hope at that time, to save Singapore culture and history from looters. Currently, this museum turned to the hisoty museum, however they dosen’t mention about the story of hope but only the story of terrible enemies. This stamp constructed some element of the three countories. Mail servise originated in UK. 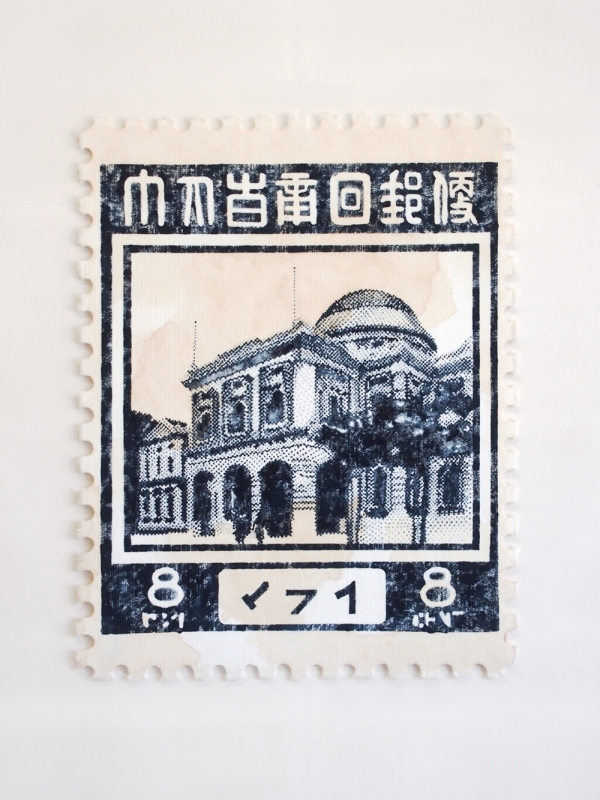 The design of the stamp followed the actual stamp published in Singapore under Japanese occupation. Tea leaves were being deliverd from Japan to England via Singapore.